Buzzword game is fun for family memebers of all ages. 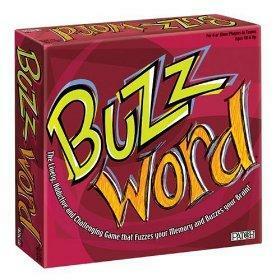 Buzzword game will not only get your party started, but it will keep it buzzing all night long. One point is awarded for each correct answer. However, any unanswered clues are given to the opposing team for a chance to steal a point. The first team to reach 50 points wins the game. Buzzword is ideal for small parties or family get-togethers. The original version is recommended for individuals age 10 and up, but any quick-thinking youngster could contribute to his team provided he understands the rules of the game. If your family enjoys playing games like Taboo and Catchphrase, then Buzzword is a definite must-have for your game collection. Easy set-up: The game takes less than a minute to get ready. What's more, it's a fast moving game, which means it can be played twice in one night. Fun and funny: Not only is Buzzword an enjoyable game to play on family game night, but the answers some players give are so hilarious, you may have to take a break just to compose yourselves before continuing with the clue giving. Great party game: Buzzword is made for small groups. It's the perfect game to play at sleepovers, family gatherings or parties. It's lively and entertaining, plus it keeps your mind active and is a great memory exercise. Restrictions: Buzzword's biggest downfall is that you can't make up your own clues. Rather, you must use the clues printed on the cards. This can stifle a person's creativity a bit, but it also ensures that the clue-reader doesn't get stuck trying to think of a clue to give. This is especially important given that you are only allotted 45 seconds to give clues. Group game: Buzzword is not a game you can play solo. You need a minimum of four players to get the ball rolling. The game doesn't lend itself to large numbers of players either. When you have more than six individuals on one team it gets tough to decipher what everyone is saying. Age matters: A well-versed child could do quite well playing Buzzword, but age does come into play with some of the Buzzwords. Some of the clues can be challenging for children, especially those who haven't been alive long enough to know that "Packers" refers to the Green Bay Packers and "Packers fans' fashionable headgear," is a clue for "cheesehead." Patch Products also sells a children's version of Buzzword called Buzzword Junior. It's designed for kids ages 12 and under. While the rules are identical to the original Buzzword, the junior version caters to younger kids and features age-appropriate clues. For example, if the Buzzword is "see" and the clue is "teeter-totter," children would try to get their teammates to shout, "seesaw" before time runs out.